Gear Hobs | Involute Hob Manufacturers & Exporters in India | Steelmans Gear Unit. Single Thread Involute: These Hobs utilize straight calculated sides for producing gears for most extreme precision on adapt hobbing machines. Processes where no consequent tooth completing operations are required. Where enhanced exactness before tooth shaving operations is required. Single Thread Involute Hobs utilize straight calculated sides for producing gears for most extreme precision on outfit hobbing machines. They are typically determined for: Processes where no resulting tooth completing operations are required where enhanced exactness before tooth shaving operations is required. Different Thread Involute Hobs: These hobs are intended to build profitability of the hobbing procedure. 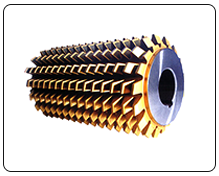 Progressions in hob producing have enhanced the quality to permit complete the process of hobbing with a various string hob. Contingent upon the lead edge, they will be either straight or winding sliced. Involute Spline Hobs: Involute Spline Hobs have straight sides teeth like an apparatus hob, and are as a rule of stub tooth profundity. They are made in single or various string outlines, with diametral pitches gone from 2.5/5 to 128/256 and weight edges of 30Â°, 37.5Â°, or 45Â°.